Our MikeFit MFN Ambassador & Sponsorship Program is now open! We are looking for fitness-passionate individuals nationwide who can help us share our mission of unleashing physical performance. If this describes you or someone you know, please apply and allow us support your goals to becoming your ultimate best while representing a world-class fitness and nutrition brand. We are always looking for new faces and representatives! You are not required to sell anything and there are no fees to join! Have you been an Ambassador or Sponsored Athlete for other Companies Before? 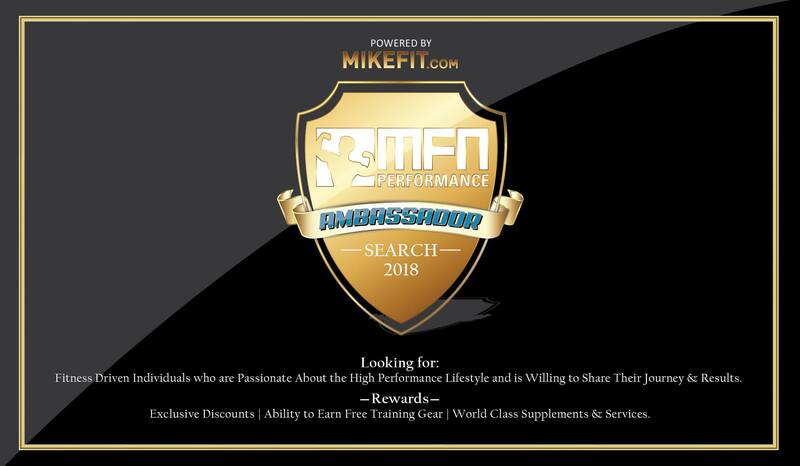 If Accepted, What would you be able to do to represent Mikefit.com & MFN Performance? Requirements: Must be personable and have the potential to make an incredible transformation. Post a photo of your results and represent our high performance way of life. That's it! - FREE gift cards to share during the holidays! Requirements: For social media influencers, bloggers, and national athletes (minimum 3k+followers). Must be social media savvy, share exercise videos and engage with audience and company.